Former French prime minister Manuel Valls, who was born in Barcelona and is running for mayor of Spain's second largest city, and Peru's Mario Vargas Llosa, a Nobel Prize-winning author who became a Spanish citizen in the 1990s and has spoken out in favour of conservative Spanish causes, were among those who attended the Madrid protest. But Sanchez's government broke off negotiations on Friday, when Vice-President Carmen Calvo said the separatists wouldn't budge from their demand for an independence referendum. Protesters hold a banner reading "Sanchez resignation". 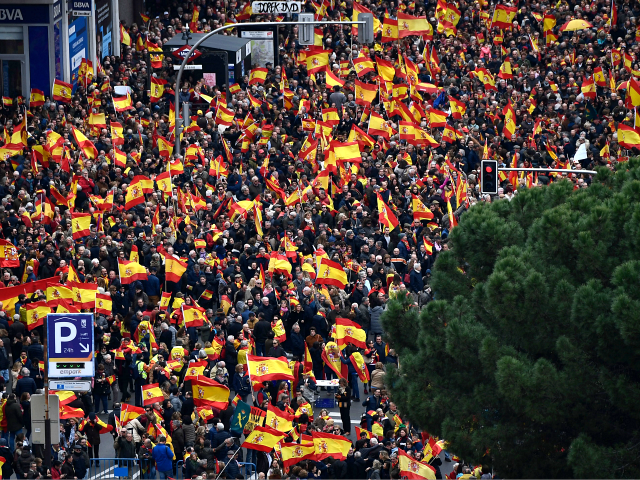 Organisers said over 200,000 people took part on the rally held under the slogan "For a united Spain". The conservative opposition Popular Party and the centre-right Citizens party organised the rally, which was also backed by the upstart far-right Vox and other marginal far-right parties. Despite the government's concession, Catalan separatist parties still refuse to back the government's 2019 budget.